Staveley Ladies' first team, who were denied the league title in the last match of the season. Officials are hoping that a superb season for a hockey team will encourage and inspire more women to take up the sport. Staveley Women’s Hockey Club have enjoyed their best campaign for many years in the Derbyshire League. Only their first defeat of the season, in their last match on Saturday, against a powerful side from Repton School (see below) denied coach Daniel Nelis’s side the First Division title. “But the result doesn’t reflect the amazingly successful year our first team has had,” said club chair, Anne Kenney. “It’s been quite a season, extremely exciting, and I am still very keen to celebrate our success and promote female hockey in the Chesterfield region. Anne’s views were echoed by Nelis, who himself plays for Chesterfield. He said: “We would like to encourage more women and girls to get involved and come down to the club. THEIR first defeat of the season, in their final fixture, robbed brave Staveley Ladies of the First Division title in the Derbyshire Women’s Hockey League. Staveley went into the title decider against Repton Ladies 2nd top of the table and unbeaten. But their illustrious opponents, who are based at Repton School where full-time coaches are employed, dragged two overseas professionals into their starting line-up and inflicted a 6-0 beating. 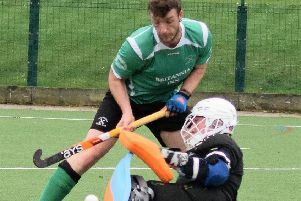 It meant the sides finished level on points, but Repton were crowned champions, and so won promotion to the Midland League, thanks to a superior goal-difference. Nelis heaped praise on captain Lauren Walton and vice-captain Ruth Elliott for their “vital influence” on the team. “Lauren has drawn on her experience and put her faith in a lot of good, young players,” he added.